As a courtesy to our patients, our office will submit dental insurance claims to your insurance carrier in order to achieve the maximum reimbursement to which you are entitled. Once the treatment has been completed, there is no need for you to take any further action. The dental insurance carrier will send a reimbursement check on their covered services directly to the patient. If you do carry dental insurance, we request that you please bring a copy of your insurance information with you to your appointment. 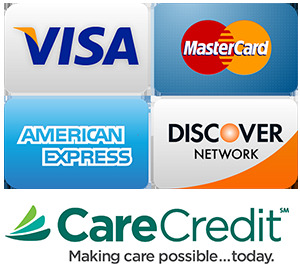 Our office accepts the following forms of payment: Cash, Check, Visa, Mastercard, American Express, Discover, and CareCredit.